Kevin Ganowsky is President of RAM Manufacturing Company Incorporated a 2nd generation family owned business. Mr. Ganowsky has over 30 years experience and expertise in designing, developing, and manufacturing technical products for the aerospace industry. Since 2008 he has led RAM Company to astounding growth, an average of 13% per year. Under his leadership RAM’s engineering team is developing an average of 25 new products per year, doubling their facility not once, but twice with expansions in 2008 and now the most recent expansion of 71,000 sq./ft. in 2018. RAM Company prides itself in developing products for commercial & military aircraft as well as rocket propulsion and life support systems for the space industry. Kevin is a graduate of Dixie State University and Utah State University. Kevin earned his degree in Mechanical Engineering with an emphasis is Manufacturing. 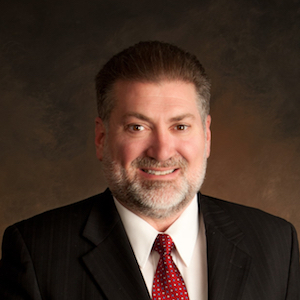 He has also served on the State Board of Utah Manufacturers Association. Kevin is married to his high school sweetheart, Rebecca Holland Ganowsky. They are the parents of one daughter and two sons. Kevin has been a resident of St. George since 1974. Kevin loves spending time with his family, drawing, and playing golf.